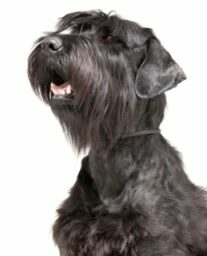 How to stop a Miniature Schnauzer barking unnecessarily can be an issue for new dog owners. As we all know, dogs will bark and Miniature Schnauzers are no exception. Your Miniature Schnauzer sees it as his job to let you know what’s going on in his world. And of course, that includes your world too. Your Miniature Schnauzer is simply behaving in the way he believes he should. He will do so until you help him to understand that certain noises and activities are okay. He needs to be taught that not everything is his concern. Of course a puppy’s main way of communication is by barking. We must expect that he will bark at times. You need to be patient with your puppy while he is young. Train him to understand when barking is acceptable or not acceptable. Your Miniature Schnauzer is an energetic and faithful puppy that will, by nature, alert you to anyone entering your property. Whether the visitor is a stranger, friend or family member your puppy will announce their arrival. He is always overjoyed to welcome you home and will greet you by barking. With careful training his barking will be spontaneous and brief. When friends your puppy has come to know visit your home, your Miniature Schnauzer will be alert and welcoming with his barking. It is important that you take control of his enthusiastic welcoming by training your Miniature Schnauzer to stay and sit so that he is not jumping up at your visitors and causing them to feel uncomfortable. With perseverance, and as he matures, he will learn to accept visitors and forget about the reward. In the meantime it is essential to reward him immediately upon his correct response. Consistency in training methods is of vital importance while your puppy is learning obedience. At times your Miniature Schnauzer may become anxious or nervous for reasons that you may find difficult to identify. My daughter and her family have a Schnauzer who becomes extremely distressed when the weather is stormy and the wind rages around the outside of the house. This is often a concern due to the fact that the city in which they live is renowned for its windy weather. So the upside for Zico is that in times of stormy weather he gets extra love, cuddles and attention; a very lucky puppy who is dearly loved at all times. So in the event of your Miniature Schnauzer showing signs of distress by continual barking and not responding to your commands, do stop and listen for any sounds or disturbances that may be upsetting him. Remember that dogs are sensitive to noises that sometimes we humans can’t hear or distinguish. Much patience and understanding is required at times to calm these wonderful canine creatures. Lack of activity can lead to boredom and may be a cause for your Miniature Schnauzer to bark constantly. You can easily remedy boredom by taking your puppy for a walk or have him play with a ball, or other suitable toy, outside in your garden providing you have a fenced area where he will be safe. It is of great importance to control your Miniature Schnauzer’s barking so that he is not causing a disturbance in your neighborhood. As the owner of a beloved puppy, it is our responsibility to be alert to the traits of his breed, to learn about his strengths and weaknesses and take the necessary time to train him to be the best behaved puppy one could possibly own. I have two schnauzers. They are sisters and are 2 and a half. We moved to a new house in December, it is on the golf course and we are not allowed to have anything but a see thru fence. We have a doggie door so they go out at will and of course anytime they hear anything. They bark at neighbors, golfers, walkers etc and we are getting complaints. Any suggestions??? Cindy, I am pleased to learn that you have two lovely schnauzers, but I’m concerned that you are getting complaints about their barking. My daughter and her family have a similar situation with their schnauzer barking constantly at neighbors walking along the street. The Council threatened to take the schnauzer away if they received another complaint. A quick solution had to be found. As much as my daughter didn’t want to put a bark collar on her dog, she had to do it. It was the only quick remedy. I am sorry to say that is the only way I can suggest for you to stop your dogs barking immediately. Of course, training is available and I highly recommend Doggy Dan’s training, as you will see on this website. But for now, you need a quick fix and bark collars are the only solution I know of. There are many brands. My daughter uses a Dogtra bark collar and her dog no longer barks. However, I am not recommending this long term, because bark collars give the dogs a shock. But what I can say is that the schnauzer in our family is now quiet and well behaved, and is happy and greets people without barking. I wish you all the best Cindy, and I would interested to know if you’ve been able to control this problem. Hi Karroll, I’m very sorry to learn about the difficulties with this dog. Have you tried being in another part of the house with just the 2 dogs and no other family members present? If you haven’t tried that, then I suggest you do try it. What I’m thinking is that perhaps there is something in the basement area upsetting this little dog. As you say, she is anxious. The reasons for anxiety can be hard to identify, other than a dog being on its own, which isn’t the case here. It seems that if you can’t identify this problem by doing what I’ve mentioned, or with help from your family, the best thing would be to speak with a professional dog trainer in your area. On my website, there are links to a dog trainer, who is an expert with understanding dogs and solving problems. If you were to click on one of those links, preferably on my page about ‘Anxiety’ you can watch a video and hear what Dan has to say. Please be assured I’m not trying to sell you anything. I care about the problem with this dog and I hope you can get some professional help if need be. I’m not a professional dog trainer. I am a dedicated lover of dogs and help where I can. I wish you the best of success in finding help for this little dog. My sincere wishes to you, Fiona, in respect to the health of your puppy.